Trash in the Green River: Who’s to Blame? Go to komonews.com and watch the video about trash dumped in the Green River in Washington. There are shopping carts, bicycles, CDs, all kinds of horrible things that shouldn’t be in our drinking water sources. Obviously no one knows who did it, and no one seems to want to clean it up. With all the trash dumped around my neighborhood, I would hate to see what is at the bottom of the Harpeth River. And can someone tell me why anyone would want to roll a shopping cart down a highway or into a creek? Trash in the Green River: Who's to Blame? 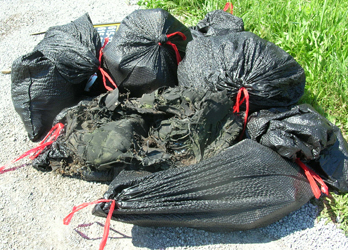 PlanetTrash participated in another Great American Clean Up event yesterday. We sponsored two this year and will do more, earlier, next year. We fought ticks in the May events. Not fun. 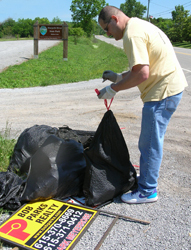 PlanetTrash was scratched by one of the metal signs a brave volunteer rescued from floating away in the Harpeth River. We immediately drove to a local pharmacy and received a tetanus shot. Critters (even ourselves) can be harmed by the trash we fail to remove. While our contribution to the GACU was modest, we are proud. Let’s try to reduce the amount of litter volunteers have to clean up next year. Don’t Litter.